We're all gonna die sometime, and most of us don't get the choice of how we want to go. I think a lot of people are afraid of dying by fire, drowning, or llama stampede - you know, the standard stuff. But Death by Cube? That's just terrifying. I'm checking this one off the list of "ways not to go." I mean, Look at the blooo...err oil. Yeah, that's red oil from dead robot cubes. 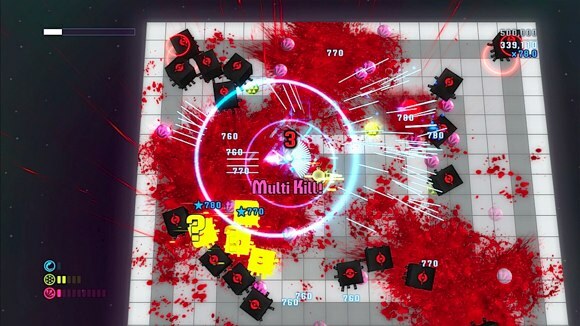 Death by Cube is a new twin stick shooter from Square-Enix hitting the Xbox Live Arcade on January 20th. The 800 game features an 8 player cooperative mode, though details of it are still kind of sketchy. There's a thinly veiled story at play, something about robots and survival or something. But does anyone really care? Death by Cube jumps off of the screen at you with pristine white block levels that quickly become splattered with the guts of fallen blocks. Joystiq and Wired both went hands on with the game last year and came away pretty impressed. Honestly, it has to be better than Square's recent 0 Day Attack on Earth, right? We'll have a review of that one early next week. Page created in 0.5963 seconds.